Reading recovered from 2-1 down to beat Brentford 3-2 and stretch their unbeaten record to six matches, further strengthening their play-off hopes. Reading went ahead midway through the first half through John Swift but Brentford struck twice in four minutes after the break through Jota and Lasse Vibe. But Reading clinched victory, also with two goals in four minutes late on, as Danny Williams tucked in a Garath McCleary cross and substitute Roy Beerens took advantage of an error by Brentford keeper Daniel Bentley. Reading's form had dipped of late, with successive draws at Ipswich and at home to Barnsley in their previous outings. But they were still undefeated in five matches as they attempted to maintain their play-off push. Brentford, threatening neither the top six nor bottom three, had registered just one win in their past five league outings and lost 4-2 at Preston on Saturday. They started brightly but when Sergi Canos found himself free on the edge of the home area, his well-struck attempt flew high and wide. Reading replied with a sustained spell of pressure, with Bentley having to palm away a dangerous cross from Jordon Mutch as loanee Lewis Grabban, on his first start, waited to pounce. Grabban raced through alone only for Bentley to clear hastily and the increasingly influential McCleary drove over when free 20 yards out. Swift was first to react to the rebound and drilled past Bentley for his eighth goal of the season. 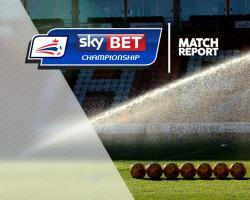 Reading could have increased their lead but Liam Moore and Grabban both missed good openings. But Brentford finished the half the stronger, with Canos shooting wide and Nico Yennaris forcing a smart save from home keeper Ali Al Habsi. Al Habsi had to save again to deny Jota while Vibe nodded narrowly wide as the interval approached. Brentford continued in the second period where they had left off in the first, with Canos cutting in from the left. But although he appeared to have Al Habsi struggling, his effort flew into the side netting. Reading gradually made headway and Bentley had to move to keep out a goalbound free-kick from Jordan Obita from wide on the right. Brentford were finally rewarded for all their attacking efforts when they equalised in the 63rd minute. Substitute Florian Jozefzoon had been on the pitch only two minutes when he cleverly set up Jota to guide home from close range. Three minutes later, Vibe dummied Al Habsi at the near post before cutely chipping home, Chris Gunter's despairing header only helping the ball on its way in. Williams levelled for Reading from close range in the 77th minute before Reading snatched victory after Bentley sliced a clearance to Yann Kermorgant and his mis-hit shot at the empty net was tapped in by Beerens.